Wildblaster Casino will then reward you with a bonus (Welcome Bonus is for new players only). The terms and conditions of the bonuses vary between different casinos and might also change over time and between different countries, so it is important to compare the different offers and read the T&C for Wildblaster Casino before signing up. 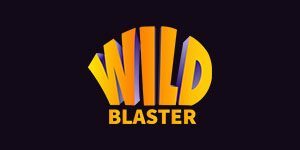 Wild Blaster is an instant play and mobile online casino offered in many languages – English, German, Swedish, Finnish, Norwegian, Polish, Russian, Portuguese, French and Spanish. Registered and established under the laws of Curacao, it is furthermore publicly audited and verified by COMODO. Being owned by Direx N.V. Casinos is not a small thing. This new online casino has already teamed up with an enormous army of powerful online content suppliers that are counted in dozens. Thanks to the grand number, there is a special section for Bitcoin games as well. The top-tier software providers have made sure to equip the venue with a superfluity of slots, table games, live dealer titles and casual games as well. Get ready for an avalanche of slots at Wild Blaster Casino! The lobby covers pretty much everything that’s happening on the market right now. Enjoy the freshest titles by the biggest names in the industry and get filthy rich with their progressive jackpots, too! The hottest games at this online casino at the moment include Microgaming’s Crystal Rift and Icy Gems, Playson’s Wild Warriors, Booming’s seasonal feel-good slot Rudolph’s Ride and Play’n GO’s Banana Rock. Since you’re there, why not try your luck with some of the casino’s progressives? The collection includes Mega Moolah, Major Millions, The Glam Life, Fruit Fiesta and 2 Dragons. Among card and table games you will find about 100 diverse titles that include the likes of Baccarat, Blackjack, Roulette, Cribbage, Hi Lo, Big 5, Craps, Super Six, Pontoon and so many more. Moreover, you will stumble upon a variety of newer editions like Baccarat Gold, European Blackjack and Blackjack Redeal. Stay tuned for the same games in their live versions at Wild Blaster Casino! All video poker enthusiasts will have quite a bunch of games to look forward to. The lobby includes every possible video poker title in all of their forms, in both single and multi hand modes. You don’t believe us? Here, you can play on Jacks or Better, Deuces Wild, Joker Poker, Tens or Better, Poker Pursuit, Bowling Strike, Five Draw Poker, and that’s just a few of them! In addition, the site offers a diapason of scratch card and lottery games from an army of providers such as Scratch Dice, Spinlotto Scratch, The Link Scratch and Game Set and Scratch. Such a lavish online casino naturally offers a Live Casino department that is just as lavish. In Wild Blaster Casino’s orders you will find a plethora of live dealer games from popular suppliers, and they include Live Baccarat, Live Blackjack, Live Punto Banco and Live Roulette, while dozens of their modernised variants are featured, too. An attractive and humorous croupier will wait for you around the clock; you call the shots – pick a game and enjoy the party! All rules that apply at land-based casinos apply at Wild Blaster Casino as well, so there is nothing shady or unfamiliar here. What’s more, all games are broadcast from a professional casino studio utilising an advanced webcam and sound technology. With its own affiliate programme, Wild Blaster Casino makes sure you get a smooth easy banking experience while gambling with them. Offering high withdrawal limits, diverse banking methods (including cryptocurrency) and quick service, the venue might be among the fastest and most professional to deal with banking in the industry. Every day you can withdraw 4,000, while every 7 days you can get paid out 15,000. After a month you get the chance to withdraw 40,000 at most, which are all phenomenal amounts. Bigger withdrawals might require verification of identity however, so have your personal data at hand. While deposits are instant, withdrawal times vary depending on the option you go for. Ewallets are always processed within 12 hours upon request submission, while other methods take a bit longer: cards will be processed within 24 hours, and bank wire transfers take up to 5 working days. The additional pending time for all methods for the money to land onto your account is 24 hours. In addition, the tender accepts an ample range of currencies such as Euros, Swedish kronor, Norwegian kroner, American dollars and Australian dollars. With the helpful FAQ section compiled specifically for Wild Blaster Casino, there is not much likelihood that you will need additional assistance. However, if you do, or you simply want to have a chat with a friendly customer support team representative, you can do so in just a couple of clicks. Available on the homepage is the nifty Live Chat facility that is open around the clock and caters for instantaneous help anytime. Moreover, for lengthier enquiries you can send them an email to [email protected] Do however make sure to exclude your banking details such as your credit card number or PIN as this kind of correspondence might be disrupted by a third party. Alternatively, fill out the on-site contact form found under ‘Support’ and get a reply within a few hours.